These exciting, challenging, and deeply touching true stories chronicle the lives of ordinary men and women whose trust in God accomplished extraordinary exploits for His kingdom and glory. Written specifically to challenge readers with the powerful lives of missionaries who have profoundly shaped history, these books answer today's call for positive role models and for opportunities to see how God works through the lives of those who follow him. 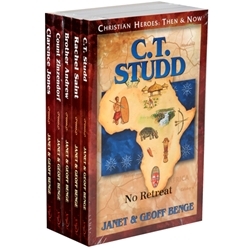 The exciting life stories of these heroes will inspire readers as they witness the drama of faith and character being tested under the most extreme circumstances. Readers of all ages love these fast-paced adventures that take them to the heart of a nation, an era, and what it means to live a life dedicated to serving God and those He loves. Parents report that even kids who have never liked to read have eagerly read all of these - sometimes more than once!